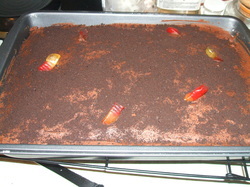 Chocolate cake with chocolate fudge frosting, gummy worms and oreo crumbs take it from a cake to a "dirt" cake! Perfect for Halloween parties! 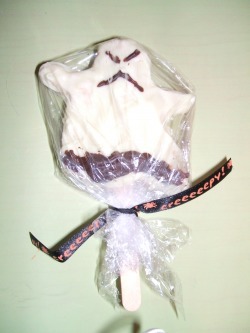 These are Rice Krispie ghosts covered with white chocolate and put on a stick to go in the goodie bags for my oldest daughter's Halloween themed birthday party. 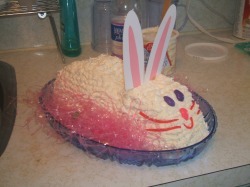 White cake on bottom with vanilla buttercream. Top present is chocolate cake with chocolate fudge frosting. 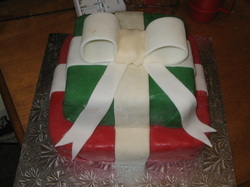 "Wrapping paper" is modelling chocolate and "ribbon" and "bow" are fondant. 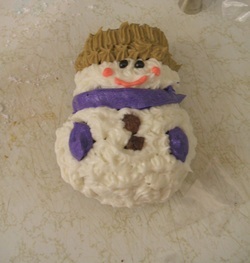 These little cuties are snowman cupcakes. Available in a variety of flavors, in this case chocolate covered in buttercream icing. 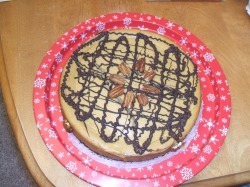 Pumpkin cheesecake on an oreo crust with pecans and chocolate drizzle. 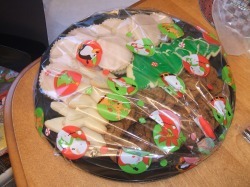 A tray of cookies made for the Christmas party at the playgroup I take my youngest daughter to. 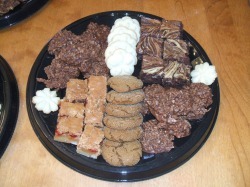 A dainty sampler, popular at Christmas. Clockwise from the top left corner they are drop cookies (top left and bottom right), spritz cookies (the white ones), cream cheese brownies, ginger spice cookies and yum yum bars.